Red- My Daddy feeds me Sun-Maid raisins. White- My Mommy feeds me Sun-Maid raisins. 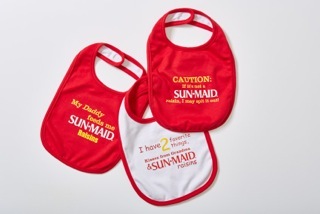 Red- I have 2 favorite things, hugs from Grandpa and Sun-Maid raisins. White- I have 2 favorite things, kisses from Grandma and Sun-Maid raisins. Red - CAUTION: If it’s not a SUN-MAID raisin, I may spit it out!